Can Your Hood Handle the Heat? Home|Blog|Uncategorized|Can Your Hood Handle the Heat? Professional style ranges are now a must-have in modern kitchens, but what many people don’t realize is how much more heat these high-end ranges produce. And with high heat, comes the production of more steam and smoke along with cooking odors. Open plan log homes make ventilation and exhaust control an important part of planning the kitchen and maintaining air quality in the living spaces. 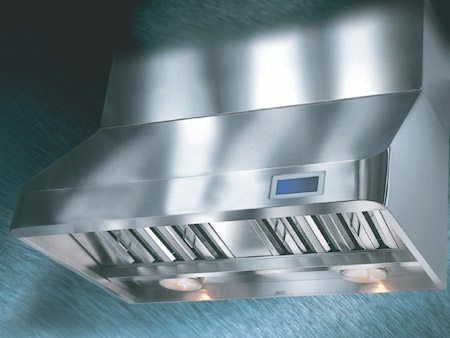 The standard measure for exhaust hoods is based on the amount of heat or BTUs the range produces. Generally that measure is 100 cubic feet per minute (CFM) for each 10,000 BTUs. Therefore if your professional six-burner gas range has a maximum output of 80,000 BTUs, you’ll want a minimum of 800 CFM for your hood. If you tend to use all your burners at once or use a high-output barbeque, griddle or wok, you’ll want to increase the power of the fan. It’s worth noting that these new professional-style fans have a variety of new technologies that make them quieter and more efficient than the old under the cabinet filters. You’ll want to ensure that the smoke, heat and steam from cooking are vented away from the kitchen directly to the outside, with as straight a line as possible. Venting into an attic is not advised as it can cause a fire hazard and may not pass local code. Installation height will depend on the manufacturer’s specifications and code requirements but generally 30-38 inches above the stove surface is standard. 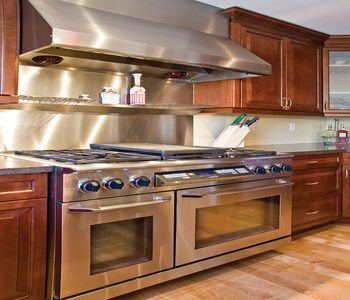 As a general rule, most standard ranges produce about 20-30,000 BTUs, with gas ranges producing slightly more heat. Professional style ranges can produce about double the BTUs, while professional ranges with six burners and heavy usage can produce 80-120,000 BTUs. It’s easy to see how the power of a range can affect the size and power of the ventilation for safe and enjoyable use. Many kitchen designers are specifying hoods that are wider than the range top for both aesthetics and efficiency. The larger hoods can make the kitchen appear even more high-tech, depending on the style of hood chosen. It also makes sense to be able to capture more of the fumes, grease and steam, as they tend to billow, rather than travel upward in a straight path. Texas-based VentAHood features their patented “Magic Lung” blower system, which maintains a low noise generation at both high and low speeds. Another manufacturer also boasting quiet operation is Kobe. Their hood and island designs offer a unique range of designs and capacities. 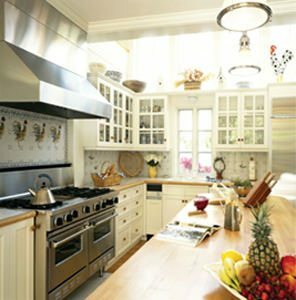 Many other manufacturers offer a selection of kitchen ventilation. The manufacturer of the range you select will also have options that are designed to ventilate your range’s capacity. Make sure you spend as much time with the ventilation appliance, components and specs to ensure that it meets your usage and style requirements. Make sure that the filters and lighting elements are easily removed for cleaning. Finally, it’s important to actually use the hood vent. Turn the hood on at the same time the burners are lit will ensure that grease, smells and vapor are conducted outside. Waiting until a pan starts to smoke or produce steam defeats the purpose of removing small particulates that can produce smells or deposit grease on surfaces.